Back to Floss Talk! The embroidery floss that I mentioned last week is Cosmo Embroidery Floss. 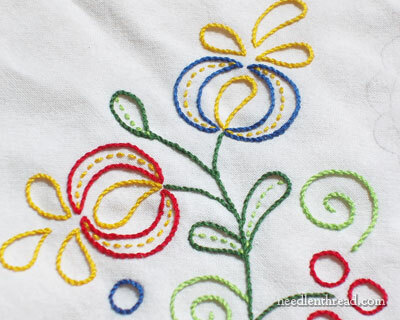 Several readers commented in the original Floss Talk post about Cosmo Embroidery Floss, so you probably already know that it isn’t a new floss, though it is new to me. It’s very popular among quilters and is found more often in quilting stores, I think, than in regular needlework shops. I’ve wanted to try out Cosmo floss for a while, after hearing about it from readers and getting several questions via e-mail about it. So far, I’ve only done a little bit of stitching with it, so I thought I’d share my first impressions. My first use of the floss is on a simple line drawing, on a flour sack towel. I’ve stitched this design before, and I had another towel already set up with the design on it, so I figured it would do for a test run of simple line stitching using stem stitch. 1. I can use a long length of floss and even towards the end of the length (about 22 inches), the floss still looks new – nary a fuzzy spot in sight. 2. There was no pilling that forms little tiny bumps or knots. The floss was very smooth, and I didn’t come across any sections with imperfections, soft threads, or areas prone to split. Overall, the floss does not seem as “soft” as DMC or Anchor. This is a good thing when working line stitches (stem stitch, backstitch, running stitch, chain stitch, outline stitch, and so forth). The thread stays twisted without wearing out with stitching. I don’t know how the Cosmo floss will fare, though, with techniques like long and short stitch shading. My next stitching test will be with long and short stitch, to see how well it “fills” the area and how smooth it looks in shading. I haven’t tested the floss yet for colorfastness. It is colorfast, apparently, so when I finish this corner, I’ll set the towel to soak for a long while and see what comes of it. So there are still two things I want to try out with Cosmo embroidery floss: filling in areas with shading techniques, and washing the floss. I’m pretty sure the later won’t pose a problem. I don’t know what to expect yet with the former. But I’ll let you know as soon as I get some more stitching done with it! 2. It is somewhat cost prohibitive, if you’re used to purchasing either DMC or Anchor. Anchor has always been the more expensive of the popular 6-stranded flosses on the market, at anywhere from $0.49 to $0.60 / skein. DMC is slightly less expensive (and easier to come by), at anywhere from $0.33 – $0.49 / skein, depending on where you buy it. Cosmo checks in at $1.06 / skein, which is quite a bit of a difference, especially if you’re purchasing lots of floss for a project. 10 skeins of floss can see you paying almost $7.00 more than DMC, if you’re buying Cosmo. Plus, if you have to order it online, then you’re stuck paying shipping as well. So the question arises: is it worth paying the difference for the thread? I’m a little torn on the point. Truly, it is a pleasure to stitch with. If you’ve ever been irritated by thread that develops fuzzy sections, or that splits or pills as you stitch, then you can imagine how nice it would be to stitch with a good length of thread and not encounter any of those problems. It’s Really Nice. What do you think? Have you tried Cosmo embroidery floss? Do you like it? Would you be game to try it, despite the cost difference? Would the price difference deter you from using it? I’d be interested to hear your opinion on the point! Feel free to leave a comment below and let us know your thoughts! DEAR , VERY NICE, WHAT IS THE POSSIBILITY TO GET MORE PATTERNS TO TRACE OFF FOR EMBROIDERY. Cosmos floss … never heard of it until now. So, I looked it up and see that there are certainly lots of colors in this 100% cotton (‘feels like silk’) floss from Japan. Hi, All – Thanks for your comments so far on Cosmo! Marny – I would say that “feels like silk” is an exaggeration. I’ve read that on some websites as well, but you know, I think it feels like cotton. It’s too “hard” of a thread (not quite the right word, but I’m not sure how else to describe it – maybe “compact”?) for it to feel like silk. It isn’t really “soft” – it is smooth, but not soft. I’m happy to see your thoughts on Cosmo floss. I was lucky to get a good deal on my collection from an on-line deal when it first became available. I like it for the same reasons you do. As for the cost, I don’t mind the investment. Buying threads for me is a hobby and I like to collect almost more than use them. Thank you for the description of this stuff. It’s new to me, too. Could you please as part of your continuing explorations, take a picture of one strand of Cosmo and one strand of DMC and Anchor of similar color against a standard linen count background? I often use one strand for fine double running stitch pieces, and am always looking for threads of different thicknesses to help achieve specific stitch densities, or to get the right look on different count grounds. Again thanks for the guided tour of Cosmo! I’ve never seen Cosmo advertised or available in the UK, so it’s new to me. The third in the market for stranded cotton here is Madeira. Do you get that in the US? I’ll probably not try the Cosmo Embroidery Floss as I have boxes of DMC. Mary, not sure if you have ever covered it but are their rules or guidelines for the number of strands to use when embroidering? 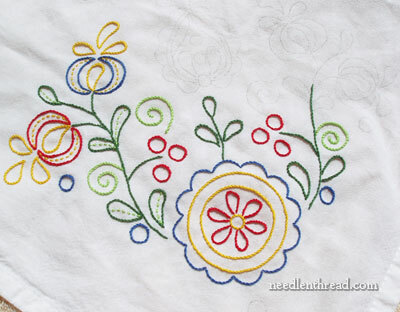 Nan – there aren’t specific “rules” for the number of threads in surface embroidery. It depends on the look you’re trying to achieve. For delicate stitching, one strand – a little bolder, two, and so forth. On the piece in this post, I’m using three strands. For counted work, that changes, though. The thread count in the fabric you’re using, and whether or not you’re stitching over one or over two, will determine the number of strands of floss you use. For example, if you’re stitching on 28 count fabric over one, you would only use one strand, because that fills the space. Rachel – Madeira stranded cotton isn’t widely available here in the US. Occasionally, we might find a shop that carries it, or we might find it on eBay – but pretty much, if we want to buy a broad range if colors in Madeira cotton, we’d probably have to order from the UK or Australia. K – yes, I’ll do some close-ups of the threads. I took some yesterday, while photographing this piece, but I used two different colors, one light and one dark. The difference between the two colors can give the impression of different sizes, so I’ll photograph a mid-tone color in both. I’ve never heard of Cosmo floss either, looks lovely. As far as the cost, all cotton flosses may go up in price. I just heard this morning on the radio about the world cotton supply. The floods in cotton producing areas, like Pakistan, have reduced this years crops by 30%, and to expect a price jump in anything that has cotton in the next few months. Might be just the incentive I need to try silks! I’d love to try Cosmo floss myself but sadly it’s not available over here. I’ve tried to buy it online but have not been successful yet. The price of 1 skein cosmo in the US is less than 1 skein DMC mouline floss in the shop here so the price would not deter me from buying it. Thanks a lot for these informations Mary. Well I am disgusted ! Here in France, DMC floss costs about $1,50 per skein ! Cosmo threads are not available at all. ah…. but you have that wonderful French cuisine quite affordable…. I bought a few skeins to try it but the cost is prohibitive. I have all the DMC threads but to purchase all the Cosmo threads would be impossible for me unless I win the lottery! I haven’t tried the Cosmo spools of 2 ply thread yet but I would love to hear your opinion of them. To pull 2 stranded floss off a spool would be wonderful. I love the feel of Cosmo floss. Really lovely. I found a web site that has the Cosmo to DMC conversion. I will type this in for you and you will have to either copy and paste it in your browser or type it in as showen. I use the Cosmo 2 strand and really, really like it. I love that I don’t have to separate! It is hard to find so I order online. Like you stated it doesn’t ravel or thin out like some and I use a really long piece. Unless I come across some Cosmo thread, don’t think I will be trying it as my stash of DMC & Anchor is enough for many many -did I say many years to come!!! And I searched your archives for the pattern that you are stitching with the Cosmo thread but could not find it. Is it available to download? As a professional stitcher for others and the fact that I enter contests. I will give this floss a try, love the fact that it will not turn fuzzy. When my DMC does that I cut the end and throw it away. I have never used Cosmo but would be willing to use it on some projects. I love the idea of using a long length of thread while stitching and it still looking good at the end of the thread. Mary this is a really useful service you are providing: evaluating different brands and types of embroidery thread. It is really helpful to get a professional, unbiased review. 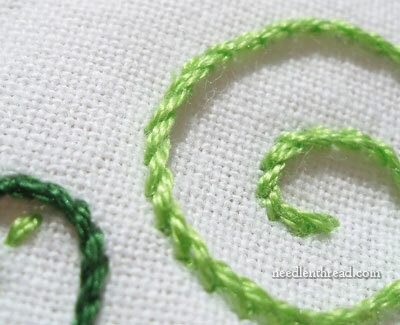 The idea of photographing a stem stitch line embroidered by each of the different threads using the same color and number of strands is just brilliant. I will look forward to seeing that. Since I have a full collection of DMC floss (don’t like Anchor) and am getting close to a full collection of Victoria Clayton’s hand dyed silk floss and Pipers silk floss, it is probably inevitable that something else would turn up. I will look for Cosmo online, since I have never seen it in the big box craft stores in my area (Joannes, Beverly, Micheals, Hancock). Thank you so much for providing all the information on this web site; it is always helpful. You are correct that Cosmo is widely known by quilters and is relatively easy to find in quilt shops. I love it, and it is now available in 2 ply on spools, which is positively lovely. I think it is well worth the additional money. You can frequently find it on sale, or quilt shops having free shipping in the US. Most quilt shops will ship internationally. 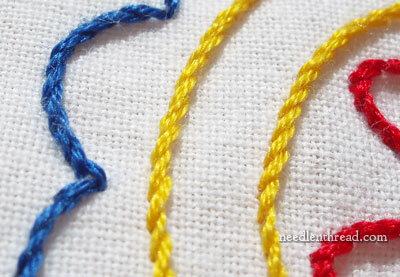 I have used cosmo threads for a couple of stitchery designs in backstitch and it was lovely to use. In Australia it is available from the Quilters and Embroiderers Store http://www.tpg.com.au. The Cosmo Marble (variegated) threads are fun to use and have 15 metres of thread, however the cost does reflect this. The drawback I found with it is while there is a conversion chart from DMC it is only approximate and being used to the lovely colour shading with DMC threads you may find the colour is somewhere in between the DMC colours. I would not use cosmo in a conversion from a DMC cross stitch design where the colours are shaded, you could end us with a rather stilted design. It is very popular for stitcheries and in this arena I love it. I have checked into this floss but wanted to find out more about it before I purchased it. I am so glad you are doing these articles on it. Bunny Hill has cosmo floss for $1.00 a skien but only has 39 colors. By the time you paid shipping though still would be way higher then DMC. I very much appreciate your articles on products. So informative; thank you. I thought the colors you chose for this piece lovely and bright; they remind me of the design on a cute teapot my mom has set aside for me to inherit! The colors of this floss are quite vibrant (and your photography wonderful, btw)but I probably will not be trying it anytime soon just because, like others before me mentioned, I have DMC to last for quite some time! I was forced, once, to try a different brand of floss when my local WalDMart quit carrying DMC. I lived in an isolated area in the Verde Valley of AZ and would have had to drive to Prescott (an hour away)or order on line. I only needed a couple colors, so stopped by a local quilt shop to see what they might have. They carried a floss called Presencia from Spain. They had a DMC conversion chart, but only had two of the five colors I needed. This prompted me to take inventory of my collection (with the chart from the DMC website) and order any missing colors from Herrschner’s! Since all of the patterns for cross stitch I’ve collected over the years use DMC colors, I’m set for awhile! I LOVE Presencia floss! I find it to be so much easier to work with than DMC. Seeing how much DMC costs, I hesitate to say how much I paid per skein when a big chain was getting rid of most of their craft area. I tried my hardest to hit all 4 of the local stores in my area … with charts from my To-Do list. Then, of course, I bought extras of a few colors, like black and white. I am glad to learn of the Cosmos thread. It would be expensive for a big project. But if the project is for something I want to display, it would be worth it. I would have to order it online. I like the look of the twisted thread, and the color is great. Thanks. i am in the middle of stitching with cosmo floss, it is very nice to work with as i am just starting this new process of stitching then finishing the piece with quilting. it is my new passion as i like to trace out the pattern, color with the crayola crayons for shading. it is quit soothing and when you are done it is a really nice different piece of hand work. i truly enjoy this new pastime. Ihave used Cosmo and feel that it is worth the price. It is so smooth. I, as you, thought there might not be a difference, but I concluded there was. It is feels strange to use my DMC on the projects I am working on, but I’m not going to NOT use my DMD. I have so much of it. I will slowly replace it with Cosmo. I also notice that Crab Apple Hill is changing over from Weeks and DMC to Cosmo. That is one reason I tried it. If they are changing, it must be good…. IT IS! I love the floss and the colors available. Question…when using the variegated floss, is it okay to “flip” the threads (when using two strands) , so the colors are mixed. Or is it better to use the two strands the way they are? Does it make any difference? I looked at the color conversion chart Cosmo>DMC but did not find any listings for the variegated colors. Any idea where I can find them? Are there conversion charts for Cosmo’s “seasons variegated” to DMC? i recently bought a project at a quilt store and didnt realize it calls for cosmo floss. i am trying to find a local shop that carries it but havent been successful yet. i dont want to pay for the shipping!! Does any of you know where I can get coloration embroidery treads convesion chart to dmc? Many thanks for a respond. Have a kit thas uses Cosmo floss.Usually get extra floss in case I run out. Checked conversion chart and no listing for Cosmo #8002; 8029; 8048 and 8049. Also there is a Cosmo # 484A, but chart only gives a conversion of 484. Can you helkp me? I just bought one skien because I loved the color of the Season#8080 to work with my wool. Will not be washing but hope it needles well. Thanks for the info on the cosmo embroidery floss however I have numbers in the cosmo that runs in the 100’s and this chart start at 200 also I show numbers in the 600 series and this chart isn’t showing any 673, 674, and 675. There is a lot of the hundred series 104,05,06,07,08, 166,17,18,19, 162,623,64,65,and 176. Do you know why it isn’t showing these numbers? I am using COSMO floss for the first time and must say I love the convenience of the 2-thread spool… so in love that I’ll pay the cost..
As for the thread itself I think there is a smoothness to it, I’m doing the Vintage Tin embroidery for a quilt top and love the way the thread seems to glide thru the double layer of fabric…. I have used Cosmos for a few projects and really like it. It seems to glide thru fabric very smoothly and strands do not get fuzzy and dull toward the end. I have a lot of DMC that I will continue to use for cross stitch but when I am doing a special embroidery project, especially on a quilt, I am going to use Cosmos from now on and hope to slowly build my collection. Luckily for me, it is available locally at a quilt shop. Just recently heard of Cosmos … as quilter, but also a cross stitcher, I’m curious about it too. A friend had some from a project that she purchased on line and she absolutely loved it and how well it worked … but nonone here abouts have heard of it. I want to try it … do you have it? Ran into Cosmo as result of a stitching “retreat” … love it! Have just completed an ‘one over one’ project with what I purchased. What a joy to stitch with this floss! Variegated has fairly long color runs, so this was especially nice. I don’t like DMC … Anchor has been my staple for years. However, Cosmo just may take over as my first choice. Has anyone tried Cosmos thread on huck toweling? I do what is called Swedish Weaving/Huck Embroidery and am wondering if it would fair better than DMC. I’ve had some of the color come off of the DMC when I pull the thread underneath the floats. Plugging our store. You can get Cosmo at http://www.aquiltforever.com. Normally I don’t do this but another comment said “hard to find”. We have solids and variegated. I’ve just bought Cosmos thread from one of our local store (Golden Dragon) in Singapore and it’s 5 cents cheaper than the DMC thread. I like the threads as it looks really silky. Now i am working a project using cosmo floss.I am so lucky found this floss.I think it is better than DMC.it is easy to find it here as i live in tokyo,japan.it is glide so smooth in the fabric.i use it for cross stitch. Hi Mary , I just came across your website and I was wondering if you mind answering a question for me. I have done tapestries for years now but the last few years in dmc wool. Is it being made cheaply now , maybe in China compared to years ago? Would you have any idea and have you heard this complaint before ? Hi, Jackie – DMC floss is still made in France, where it’s been made for a hundred plus years. Over the years, I’m sure they’ve had to conform to new dye formula regulations and requirements and so forth, but the thread is still made by DMC in France. I can’t really compare old to new when it comes to DMC – although I used it in the 80’s as a kid, I can’t recall any differences that I could comment on with certitude. I like DMC floss – I use it all the time. But I suppose if you’ve been using other thread and then going back to DMC after years of not using it, it may seem different. But I have been in contact with the folks at DMC about their manufacturing, and their threads are still made in France, a country well known for taking quality control very seriously. I hope that helps! I have been using Cosmo for a while and find that it does fray on the unnotted end; enough so that I clip the end several times. This never happens with DMC. You can get DMC as low as .25 cents on sale. The thing that I really don’t like is I’m leaving for a retreat tomorrow morning and discovered I’m low on the floss I’m using. I went to my local store that raves about this floss and they are OUT!!! I have no other project lined up and there is no other shop locally. I’m really turned off by this. I just came across Cosmos threads and I an wondering how it would react on needlepoint canvass. If it would stitch as smoothly on canvass as you say on fabric. I regret not buying some when I first saw it To bad it doesn’t come in #5 perle. Are these Cosmos flosses matte or have a sheen like DMC? They’re mercerized, just like DMC, so they have a sheen. I am sorry to say Mary that I would not waste my time getting a new thread. Once Anchor out here was considered inferior to DMC now they are about the same if not as good as. Floche it do love but I find it limited to where to get it here. The import duty makes it costly to most. There are too many threads these days and it has become cost factor. Do we really need it? Does it do a better job ? I find that Floche is easier to change the twist from S to Z. A bit of steam a shake then the good old Japanese method of twisting applied. I like it for leaves. There is a nice break between the two sides to do a stem. To keep the sheen on my floche I have two methods. An Aficot and/or a piece of fine silk. We have come a long way from when embroidery began and the changes to and of stitches has been enormous. Will our work last as well as those of past eras? I don’t really care I won’t be here and it is up to those that come after to deem the work good enough to save. As I age it is a matter for me to give myself the pleasure of doing something I enjoy. I give it away which gives me another buzz, especially if it is liked and used. Lets not leave a great stash of anything that no one really wants. Become economical and resourceful. All of us are going to die, so my son tells me, (dah). I would like to be known for more than, ‘but she did lovely embroidery’. Happy New Year, make all the must finish, to will finish. I started using Cosmo a couple of years ago. Also find hard to purchase unless ordering on line. I have used Cosmo thread for several years and I do like it, but to be perfectly honest, I can’t see that much difference in Cosmo or DMC. However, I did really like Cosmo multi-work 2 strand floss on the spool but it is almost impossible to find the colors that I want. I think they might be discontinuing it!! It seemed to me to be finer than the 6 strand and I liked to work with it but I will have to go back to 6 strand again, I’m afraid.. I have just started using Cosmo floss for the first time. Do far I don’t see much difference. The project I am working with is linen with interfacing for stability. I could make a quilt with it but mine will be a wall hanging. For the cost difference I will use DMC. Not worth the cost and having to chase down the floss. I watch for sales and pick up floss then at the local Joanne’s. Over time, I have come to see it the same way. I do like the Cosmo floss, and on colors like black, I find it smoother, but not enough of a difference for the difference in price and the lack of easy availability. I have recently begun using Cosmo. I was out of town and purchased it for the first time at a quilt shop I visited. In the project I am currently working on, I have found that it is worth a little bit of extra money to use it. The floss is so smooth – to the very end of the strand! I had never heard of it before, but I am hooked. Thankfully, when I returned home, I found that it is sold at a local quilt shop here in my home town (My Girlfriend’s Quilt Shop- for anyone who would like to order it online). I used Cosmo floss and became an instant convert. I sold all my DMC floss and have been busy buying Cosmo. Yes, it’s much more expensive, but handling the thread, seeing the sheen makes the higher cost worth every penny.